Hello! Welcome to the Jeff Gray DDS blog. If this your first visit, we hope you find useful information about our San Diego cosmetic dentistry practice. If you have read some of our previous articles, we are glad you checked back with us. We post new articles regularly. My name is Dr. Jeff Gray, DDS. I have been practicing dentistry in La Mesa since 1986. Jeff Gray DDS is a full-service dental office located at 8555 Fletcher Parkway #102, La Mesa, CA in La Mesa. In addition to providing comprehensive examinations and deep cleanings for clients in the San Diego area, we perform all types of tooth restorations. If you have old silver amalgam fillings, we can replace them with nearly-invisible fillings that are tooth colored. 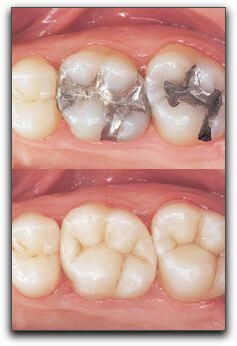 These fillings are made out of a strong composite resin. Many of our San Diego cosmetic dentistry patients have replaced their old silver fillings with fillings matched to their teeth. You can improve your smile instantly and relatively inexpensively by getting rid of the ‘metal’. Another reason some San Diego clients have had their old fillings replaced with tooth colored fillings is because they are concerned about the possible heavy metal toxicity of the mercury in the silver. If you would like to replace your amalgam fillings, call us at 619-717-8560 to schedule a consultation. We are currently accepting new patients and would be happy to show you around our San Diego cosmetic dental office and introduce you to our friendly team.